RSVP is an abbreviation for "Répondez s'il vous plaît" in French which means "Respond if you please." 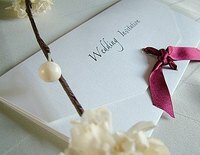 Whether the answer is yes or no, writing an RSVP is the polite thing to do, but most people do not know quite how to phrase it! Follow the guide below to write a formal RSVP that will look and sound elegant. To write a formal RSVP to any invitation it is important to choose nice stationary to write on. Black ink pens are also preferred. Check to see if there are any special instructions on where to send your RSVP or if there is an RSVP card included. A specific address may be offered for RSVP mail. Keep your RSVP short whether it is formal or not. You do not need to tell them why you cannot come. State that you either can or cannot come in a elegant and simple way. Read the invitation to see how formal it is. If they call you "Mr. and Mrs. Smith", then use that on your RSVP. "Mr. and Mrs. Smith are delighted to accept the kind invitation of Mr. and Mrs. Johnson for Saturday, the Fourth of April." "Mr. and Mrs. Smith are very pleased to accept the invitation of Mr. and Mrs. Johnson." Mr. and Mrs. John Smith"
"It is with much regret that Mr. and Mrs. Smith must decline the kind invitation of Mr. and Mrs. Johnson." "Please accept our congratulations on your upcoming wedding and know that our thoughts will be with you on your special day."